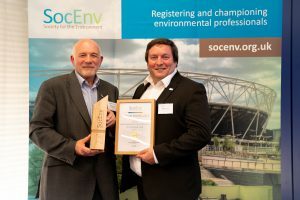 The custodians of the Chartered Environmentalist and Registered Environmental Technician professional registrations, the Society for the Environment, are delighted to launch the 2019 Environmental Professional of the Year Award nominations process. The prestigious Environmental Professional of the Year award recognises the outstanding work of Chartered Environmentalist (CEnv) and Registered Environmental Technician (REnvTech) registrants. The Award showcases the achievements of those striving to protect and enhance the environment on a daily basis and attracts a diverse range of outstanding nominations each year from across sectors and continents. The award is open to CEnv and REnvTech registrants only, and submissions are accepted for both self-nominations and nominations for your peers, colleagues or those that inspire you. Multiple nominations from one person are accepted and you are not required to be a CEnv or REnvTech in order to submit a nomination. To be in with a chance of showcasing your environmental work or the work of your peers, the Society encourages you to apply using the link below by the deadline of 12:00 BST on Wednesday 1st May 2019. Previous winners include David Stubbs CEnv, registered via the Chartered Institute of Ecology and Environmental Management (CIEEM), Martin Bigg CEnv, registered via IEMA, and the 2018 winner, Graham Powell CEnv, registered via the Institute of Water. Immediately after the 2018 presentation, Graham expressed that he was “delighted to receive the honour” and was “in shock” when his name was announced. “The 2018 award was a personal goal of mine after achieving runner up in the previous year, and I was in disbelief for the rest of the evening, and beyond! It is a proud moment for me – to be independently judged and recognised to be making a positive difference in an area of my job that I really care about is just a great feeling. To find out more about the 2018 award and the reaction, please click here. 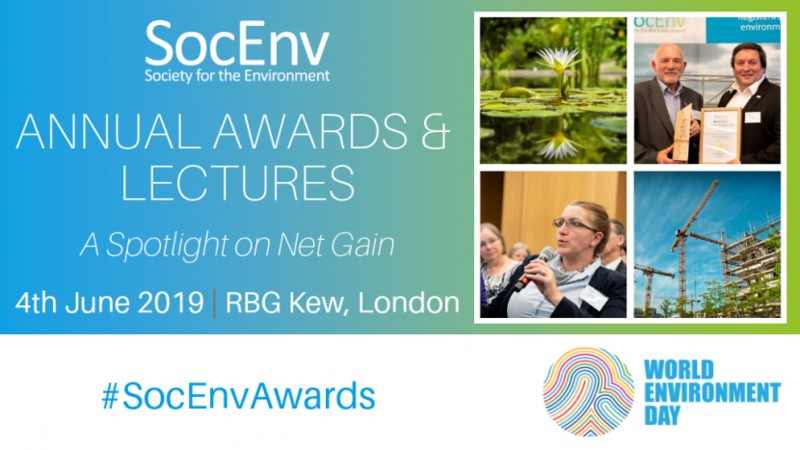 The 2019 award will be presented at the annual World Environment Day Awards and Lectures – “A Spotlight on Net Gain”, taking place at the Royal Botanic Gardens, Kew on the 4th June 2019. Registration to attend this event is now open at socenv.org.uk/event/WED2019 and is FREE for CEnv and REnvTech registrants.